Vision in Action - Diaspora Action Australia | Peace. Development. Human rights. 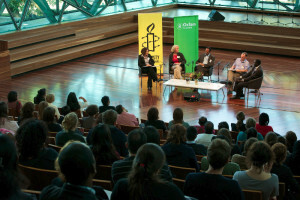 In March 2011 Diaspora Action Australia proudly hosted Vision in Action at Federation Square, Melbourne. This inspiring event attracted 250 people and celebrated the extraordinary actions of ordinary people in protecting human rights in war and conflict. Vision in Action featured a panel discussion that was moderated by the then-commissioner of the Victoria’s Equal Opportunity and Human Rights Commission, Dr Helen Szoke. The discussion centred on the relationship between the international humanitarian sector, community organisations and human rights in conflict-affected countries. Throughout the evening, attendees (including representatives from the office of the Member for Melbourne Adam Brandt, and representatives from AusAID, Oxfam Australia, Amnesty International Australia and World Vision Australia) were treated to extraordinary performances from refugee and migrant communities from West Papua, Eritrea, India and South Sudan. The Future of Rap from South Sudan closed the evening with a hard-hitting performance about child soldiers and their experience of starting their new lives in Australia.